Home / 2-DVD Set / STEVE GILLILAND LIVE! Steve’s Most Requested Keynote Recorded Live at the Mel Brooks Theatre in Las Vegas! 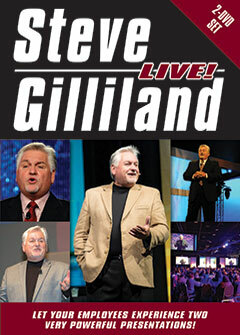 Now, for the first time ever, Steve Gilliland, Inc. makes available a DVD showcasing one of America’s premier keynote speakers. 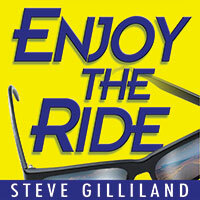 In his typical style, filled with wisdom, wit and passion, Steve Gilliland provides a wealth of practical insights on what it takes to enjoy the true joy of life – the trip! It is simple, clear and easy to grasp – yet profound! It is loaded with hope, direction, encouragement and specific procedures. This powerful keynote speech will show people that true success is not a thing you acquire or achieve. Rather, it is a journey you take your whole life long. Steve, in his refreshingly straightforward style, will show you how to change the way you live and ENJOY THE RIDE! A Powerful Keynote Recorded Live at the Orlando Convention Center! 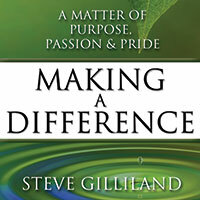 This insightful keynote speech expounds on the essentials toward Making a Difference™ – Purpose, Passion and Pride. As a master storyteller, Steve Gilliland takes you on an eye-opening journey that will uncover your hidden abilities, unleash your inner energy and share the key to accomplishing your goals. In this DVD, you will hear a wealth of new ideas, workable tactics and useful tools that, when put into practice, will make a considerable impact in your professional and personal life. Long after you’ve listened to Steve’s final words, you will be buzzing with excitement and motivated to make a difference. This speech is brilliantly creative, exceptionally humorous and absolutely unforgettable. Your skillful combination of humor and candor will be fondly remembered at our gatherings for years to come. If ever any audience would require an 'explosion of enthusiasm,' you'd be the guy I'd recommend. You dazzled the audience just as much with Making a Difference as the first time you were with us and presented Enjoy The Ride. When I contacted your office and they suggested your new keynote, Making a Difference, I knew it would be good, but never imagined the impact it would have on our employees during this difficult time.